The next morning I surveyed the damage and found lots of twigs and leaves and other small pieces of greenery littering my decks and driveway. The plastic chairs were off the deck but undamaged. The fig tree had tipped over but was soon put to rights again. 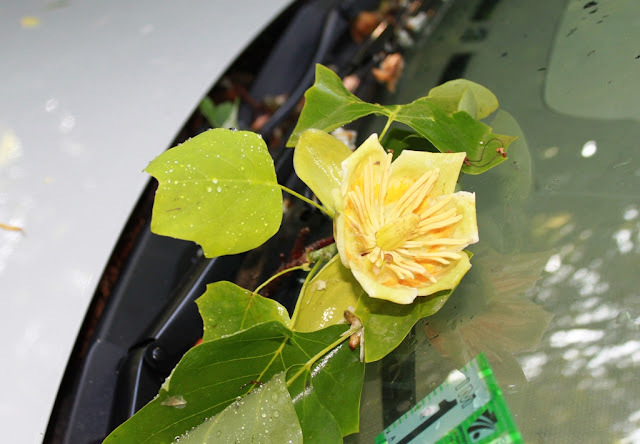 It was when I got into the car to head to work that I discovered a “gift” from the storm against my windshield. 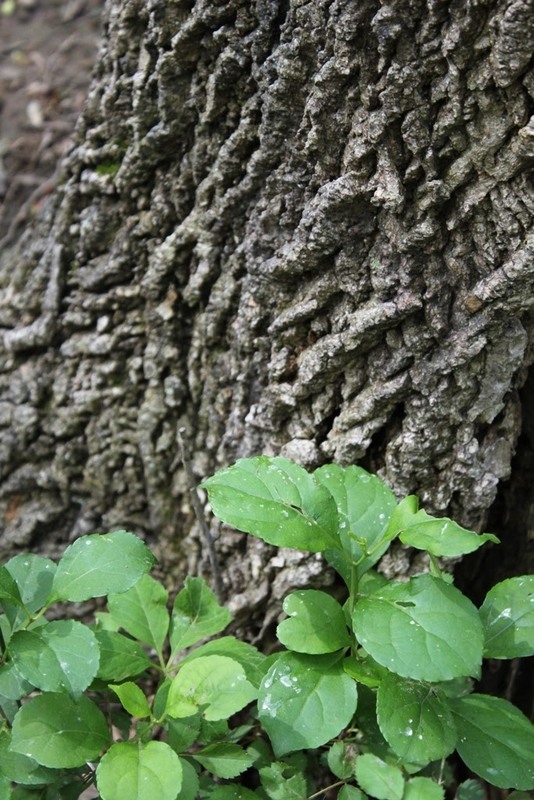 The gift is the bloom of the tulip poplar tree, usually seen only from a distance when they are high on the tree. Sometimes I find them after they’ve wilted and fallen from the tree. I don’t usually get to see one in a perfect bloom as this one is. And I’ve certainly never had one appear on my car before. True, it’s a little thing, but it’s the little things that really count, isn’t it? This kind of thing gets me to thinking about nature’s whims and just how capricious she is—one time you get the storm, the next time you get the bloom. And sometimes you get both on the same day. Last night was another doozy of a storm, though I managed not to get hit by another tornado. Folks a few miles to the north weren't as lucky, apparently. I've heard of no injuries but some 60,000 people are still out of power, lots of trees are down. None of the traffic lights are working, which played havoc with the morning commute. 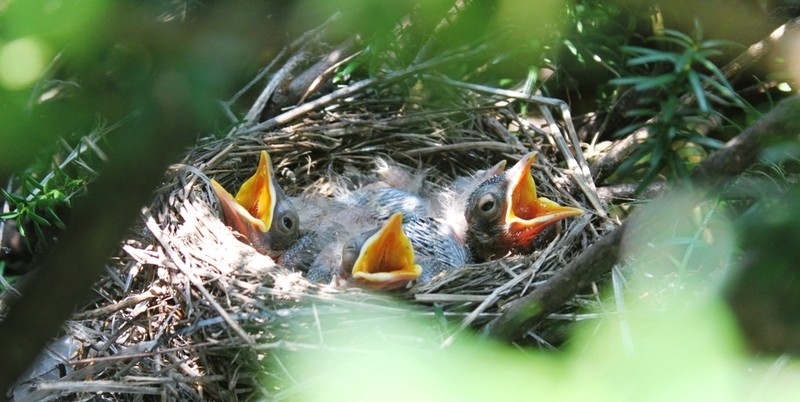 The baby robins I've been watching made it safely through the storm and are as hungry as ever, with those tiny yellow mouths anticipating breakfast. Mom robin is okay, too, this morning. Happy Friday! The pileated woodpeckers’ avian war at my cabin was quiet this morning. Whether that means the war is over, or I’m simply in a lull between battles is too soon to say. I’m happy for the quiet, even if it turns out to be temporary. 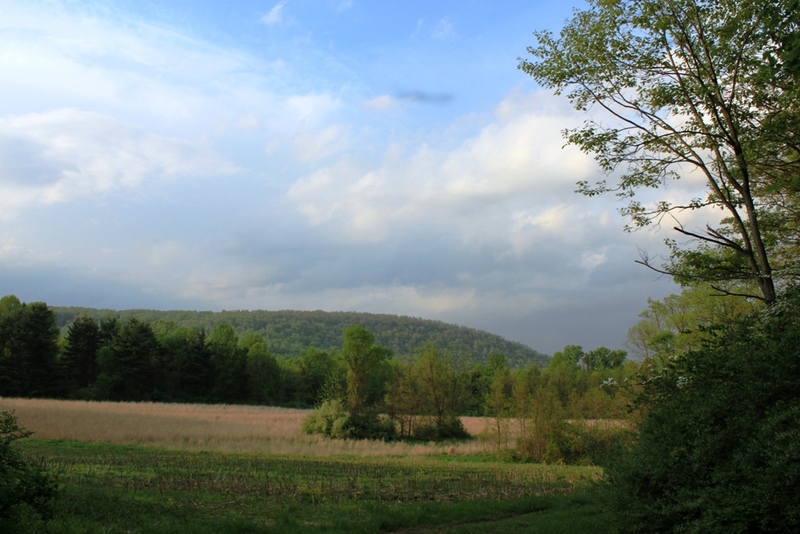 Last evening I took a walk around Roundtop, ranging in the opposite direction of my usual travels, just to see if that brought me anything new or different to see. I started out walking past the tubing lodge, heading downhill, at first on macadam, then on stone and eventually on an unimproved forest road. The weather was nice for once in this wettest of springs, and the woods were full of life. I passed a seasonal stream rushing noisily downhill, nearly covered by undergrowth. The undergrowth proved to be a valued hiding spot for both chickadees and titmice, who balanced on tiny twigs just inches above the water, occasionally dropping down to take a sip. When the road finally turned to dirt, a pair of rabbits bounced along several skips ahead of me but in no hurry to disappear. Daisies are beginning to appear along the road’s edge, now. Wild phlox and fleabane, mostly white but some a dainty pale pink, also seek the sunnier spots along the road. The evening was warm, but not too warm to enjoy a walk. Perhaps the pleasant temperature is what brought out the animals, too. In another month, the evenings will be sultry, and the idea of an evening walk less compelling. In this year, the weather has hampered my evening walking. I don’t mind walking in rain, though it is nearly always less enjoyable than a sunny evening’s walk. But this year rain has usually meant a downpour, not a gentle mist, and I draw the line at walking in a downpour. As a result, I have had few evening walks since the snow disappeared nearly two months ago now. That’s a hard truth to wrap my head around, since evening walks are usually as common for me as eating dinner—and sometimes even more so as I’ve missed many dinners in favor of a good walk. Truthfully, not much that I saw was different than the last time I walked here, at least not in any major or substantial way. Long ago I learned that the woods change almost daily, if the walker is observant. New plants and flowers all have their own moment to shine, with their dominance ascending or waning from one week to the next. Birds that noisily proclaim the spring turn quiet when nesting is underway. It’s just the normal yearly cycle of the forest. Other times, changes are more permanent. A dominant tree falls and the entire nature of the area around it changes too. But yesterday evening, that kind of change was not evident. The woods are still there. The old road is still there. And me. My cabin is the battleground for a major avian war this week. The pileated woodpeckers are causing a near-constant ruckus. It started on Saturday and was still going on as of last evening. Pileated woodpeckers are a large bird and make a lot of noise even on a good day. The local pair is nesting, I believe, in a tree at the back of the cabin. On Saturday morning I heard the woodpeckers fussing and screeching, which isn’t unusual. Something always sets them off. They return fire with scolds and screeches for a few minutes and then the perceived danger leaves and the forest returns to quiet. Except that this week the return to quiet part hasn’t happened. With the woods so thick with leaves, it was hard to see what was going on at first, though I’ve caught glimpses of the birds swooping and looping in those rare moments when they are visible. And then on Saturday, I finally got to see what was going on. A second male pileated woodpecker is apparently trying to lure the female away or perhaps just hoping to extend his territory so that it overlaps with that of the nesting pair. In any event, the actions of the second male are destroying forest harmony around my cabin. Just when I think the dust is settling, male #2 drums on a tree, and that sets off the whole round of screeching and swooping yet again. Even the dogs notice. Baby Dog, the self-appointed forest police force, is the worst. When the pileated woodpeckers really get going, she chimes in with her alarm barking. Her barking awakens Dog from his elderly slumber and then he joins in. Two barking dogs soon equals two howling dogs, and sometimes even the dogs half a mile away add to the chaos. Why I ever thought that living in the woods was peaceful is a thought I have been disabused of this week, that’s for sure. Of course my photos today depict none of this. At least they look as though my forest is filled with peace and quiet. Can you see the frog in today’s photo? 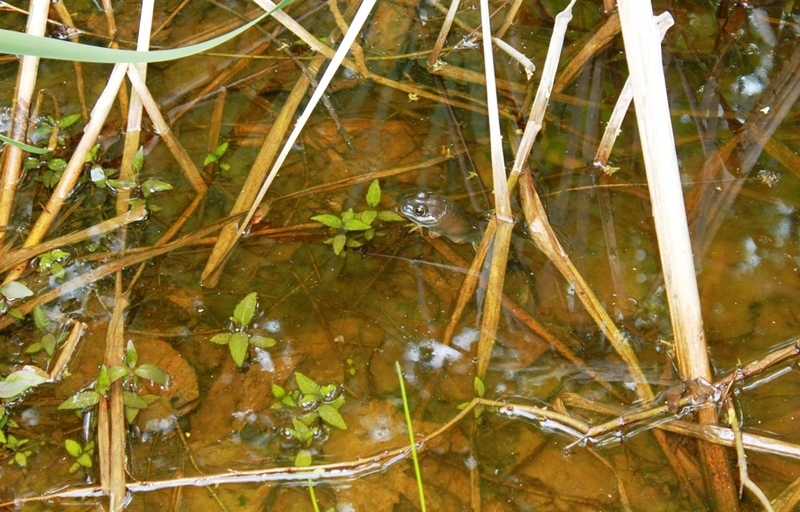 It took me a while to see the frog when I was studying this vernal pool near the cabin. Even its eyes look like bubbles on the surface. Isn’t that clever? I thought the frog might be laying eggs, but I couldn’t get close enough to tell. My feet were already wet, as I hadn't planned to go bog wallowing when I started out on a short hike. One thing about all the rain that’s fallen this spring is that the mountain is full of these vernal pools. They are great spots for frogs and tadpoles. When I hike with the kids from adventure camp, we always look for raccoon and opossum tracks here as those predators haunt pools like this one for those tadpoles. Sometimes I think the kids are as excited by the various water bugs that ply the vernal waters as they are by the tracks. This year the pools are plentiful and deep, though they will still disappear by August, if not before. Perhaps some of the tadpoles will survive to reach frog-hood, though I can’t believe that many of them will. They must, though, since the ponds are full of frogs. Around this area, everyone was pretty tired of all the rain three weeks ago. At this point, none of us really know what to say except that the rain is old news, very old news. Another 2" of it fell this morning in about 45 minutes, and with it was the requisite thunderstorm, prompting two dogs to suddenly sprout springs on their feet and magically appear in bed with me. To say everything is wet doesn't begin to do it justice. 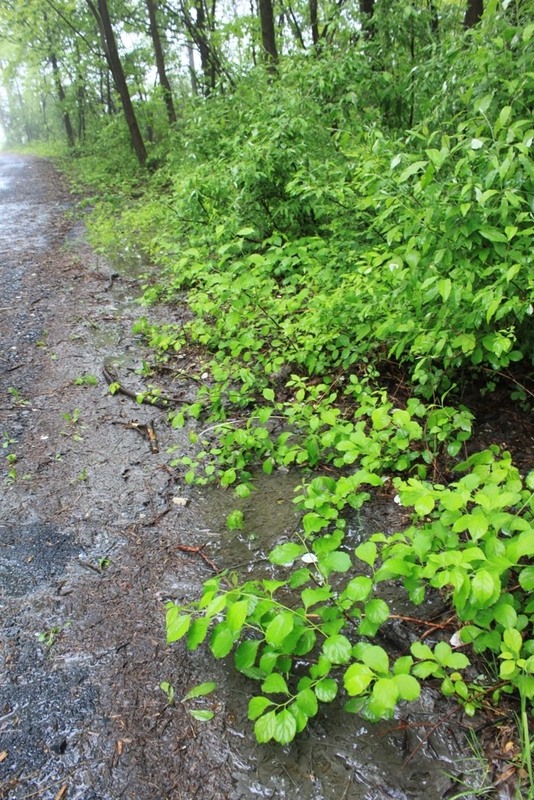 My lane is washed out again, for at least the third time this spring. The basement had water in it again this morning. 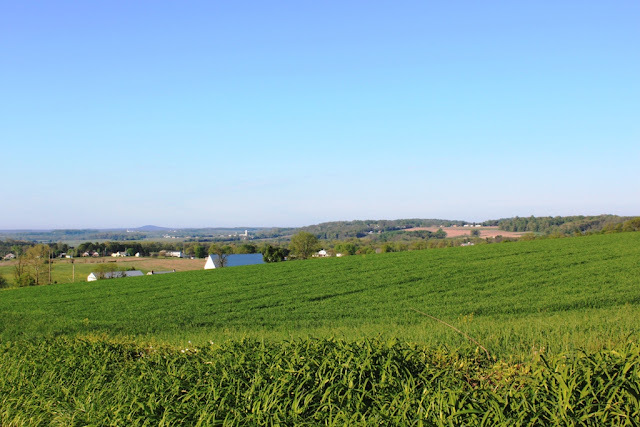 Farmers can't get into their fields to put their crops in, and it's getting late to put much in at this point. Drought happens here periodically, but I've never seen anything like this. The woods look as though it's mid-June. 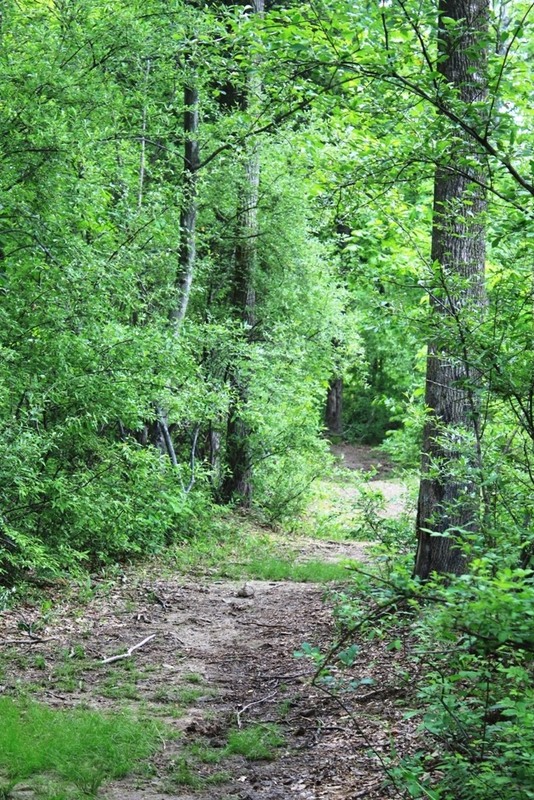 My summertime treat of bushwhacking doesn't look like it will be much fun with all that undergrowth to fight through. I guess I'll have to stick to the trails this year. Baby Dog won't even go into the woods. Of course she hates water and doesn't like to get her toes damp, let alone wet. She pees right in the middle of the driveway, well away from any of those nasty wet leaves. Most evenings, thunderstorms and heavy rain soak the mountain. I don't mind walking in the woods during a light rain, but a thunderstorm or a gully-washing downpour is just a bit much. So I'm feeling a bit nature-deprived this week. And that's really bizarre, isn't it, since I live in the middle of the woods. I just haven't been able to get out into it for a while. Yesterday the rain was so heavy that I didn’t want to take the camera outside for a photo. 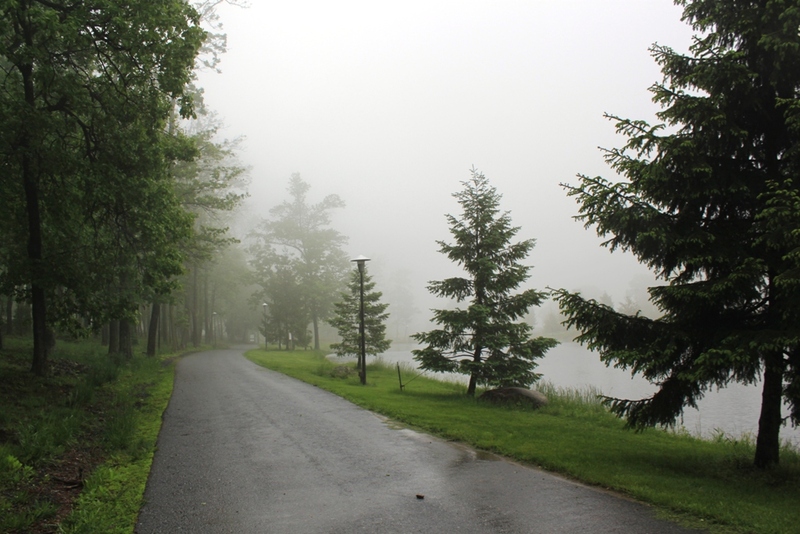 Today, as you can see, the day is still foggy and gloomy, but at least the rain is down to a drizzle. You know the weather is pretty bad when another day of drizzle is good news. The forest, apparently, loves the rain and is as lush as I’ve ever seen it. It’s as thick as a jungle, and I can’t even walk behind the cabin anymore. So much for my self-made promise of keeping ahead of the underbrush this year. It’s only mid-May and I’ve already lost that battle. The greenery along the side of the driveway is already brushing against the side of the car when I drive in. I thought I might get a chance to work on that this evening, but I’m watching thunderstorms march north on the radar, and I’m starting to think this won’t be much of an evening for being outside. So far, I have managed to keep the forest outside of the cabin. The Virginia creeper hasn’t found its way inside yet, so perhaps I should consider myself ahead of the game. I do feel a bit as though I’m a character at the beginning of a horror film, one called Attack of the Green Forest. Even though everything is still normal, you just know it’s all going to go heck in another few minutes and stay that way for the rest of the movie. On Saturday I went to an auction, the kind I don't see around here much anymore. 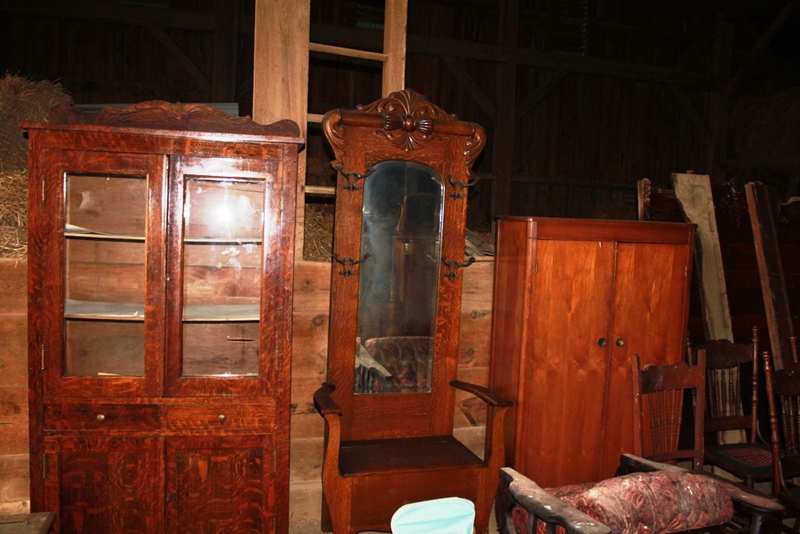 Multi-generational households are not common anymore, let alone farm household auctions. So when I heard about this one, not far from me, I had to go. And the list goes on. You don't get to see things like were sold at this auction very often. It's even rarer that to find things in such great condition and so many of nearly everything. You like quilts? 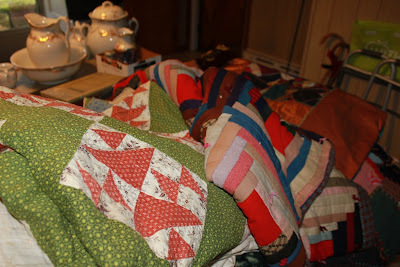 There was a log cabin quilt, crazy quilts, quilt comforters, summer quilts, a Chinese fan quilt, quilts dated 1889 or 1905 and signed by the seamstress. The most expensive quilt went for $1000--an American eagle quilt with an eagle and shield in each of the four corners. You like crocks? 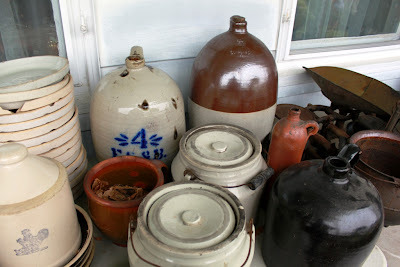 There were Cowden crocks, little crocks, big crocks, decorated crocks, jugs, unusual designs and shapes galore. The most expensive ones went for $500. There was furniture and old iron tools, some of which were the object of much discussion, mostly as to their use. All those things were heavy, and it's hard to imagine how strong someone would need to be to use them. There was chicken stuff and pig stuff, cow stuff, dishes and pretty glass items, old books, old toys. 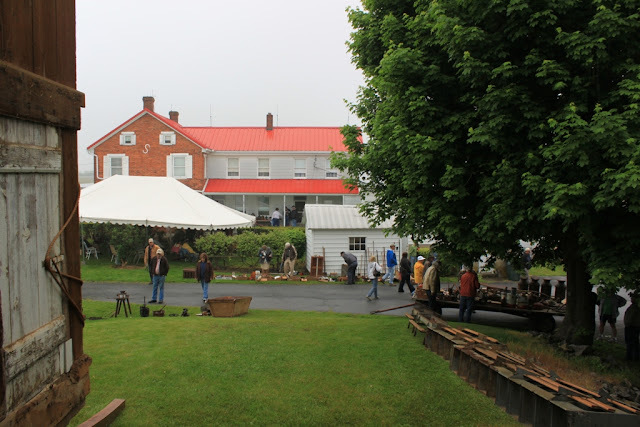 The weather did not cooperate, as it rained or drizzled all day long. Perhaps that kept the crowd smaller than it might otherwise have been. But those who didn come were prepared to buy and things did not go cheap, for the most part. Of course, as with any sale, there are always bargains to be had. You just never know if today's bargain is going to be something you really want. I love going to a good auction, even when I can't buy much. I love seeing the old items. It's better than going to a museum because at an auction you can handle anything you want. You can touch it and smell it and hold it, turn it over or tap on it. Museums don't let you do that. Once the items are sold they disappear into households or antique shops and then into more households. Museums tend to only get the best and fanciest things, so the everyday things that people used, but are just as interesting, don't usually show up in them. I like to see the things that people used and made with their own hands. I never did find out how much the old sleigh went for. That was saved for last, and I could only stay until around noon time. I can report that it was the object of much attention, though likely much of that attention was from people who weren't going to bid on it. I was interested to see that it came with a whip, and noticed that it had a little pedal on each side to put your foot as you were climbing in to it. I'll bet it didn't go cheaply. I haven't been to sale like this one in perhaps 10 years. I'm sure there's been a couple around that I missed for one reason or another. I'm awfully glad I didn't miss this one. 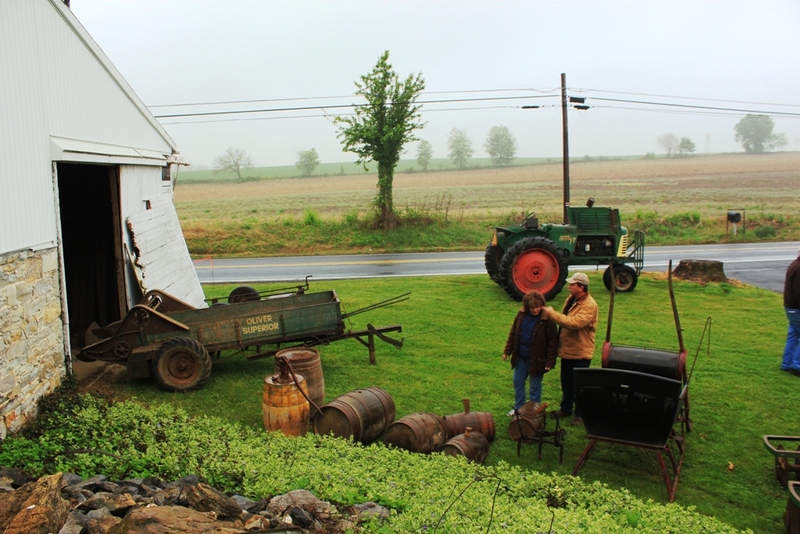 May might well be the busiest month of the year at Roundtop. Birds abound, with residents arriving and setting up housekeeping and migrants stopping for a few minutes or a day and then moving on again. Deer abound and are beginning to bring out their tiny fawns. I can’t turn around without seeing something new or different or unusual. It’s hard to get anything done around the cabin when there’s so much to look at. Last night Dog and Baby Dog started to bark and wouldn’t stop until I investigated. Five adult deer and a tiny fawn were nibbling their way up the mountain just behind the cabin. I guess the dogs thought we were under attack by a herd of deer SEALS. The deer paid little attention, no doubt knowing the dogs were inside. The wild geraniums are blooming, adding their pale lavender shade to the green of the forest. The trees have all leafed out so much now that my view has disappeared again. It will be late October, perhaps even November before I see it again. It’s not just the next-door mountain that’s disappeared either. The sky is nearly gone, too. I see tiny pinpoints of blue through greenery, but to really see what’s going on up in the sky, I have to walk out to the end of my lane. So perhaps that still-encroaching cocoon of greenery is the reason I’m posting the view this morning across Barrens Valley, just over the mountain from the cabin. There, the sky is open and crystal clear and nothing blocks the view for as far as I can see. 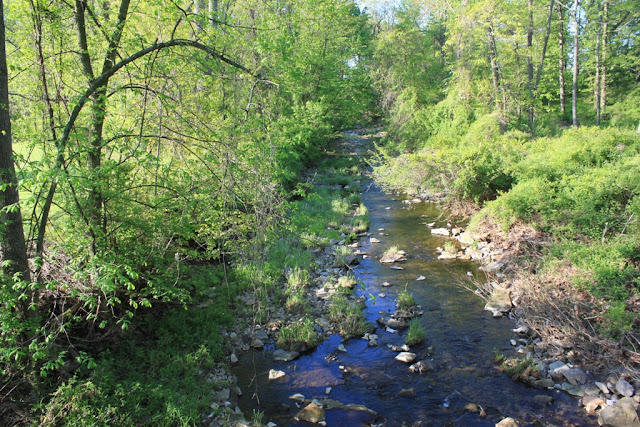 ﻿In this area, the second week of May is the prime time for wood warblers. I haven’t found many on Roundtop Mtn. yet this year. But it’s not just wood warblers that appear, though they are considered the crown jewels to eastern birders. I’ve had a very loud great crested flycatcher whooping its way along the lane for the past few days. One Baltimore oriole in particular sings so much, so loudly and so close by that I can truthfully say I’d be happy to see him move another 100 yards from the cabin. The eastern wood pewees have also arrived, one of the last of the summer residents. Their call is one of my favorites, right up there with the admittedly more melodic song of the wood thrush. The pewee is the earliest and latest song I hear each day. Its first call of the day typically starts around 4:30 a.m., when even the barest hint of dawn is still a good 45 minutes away. I’ve heard the call after 9:30 p.m., long after the last hint of paleness in the sky is gone. But like the wood thrush, the pewee’s call almost echoes through the woods. Somehow that tiny little bird fills the entire forest with its long drawn out peeee-a-weeeee. Another kind of bird has also arrived at my cabin, too—a two-year old Rhode Island red rooster. A fox took another of my hens, almost literally right from under my nose during broad daylight. The girls were outside running around the cabin while I was moving their pen. I went inside for a pair of scissors, and suddenly one was taken. It happened so quickly the fox must have been watching while I was outside. So now I’ve acquired a “protector” for the girls. If he does his job as roosters are supposed to do, I’m hoping that will be the last hen I lose to Ms. Fox. So far, the girls are not amused. And I’m not sure I’m ready for the 4:45 a.m. wake-up call he so thoughtfully provided this morning. This past weekend was the annual Apple Blossom festival in Arendtsville, Pennsylvania, one of my two favorite local festivals, the other being the Apple Harvest Festival in the same location in October. Considering how most of the spring here has been (wet), a clear and sunny day was something of a minor miracle. Add in a temperature that was not too hot and not too cold, the weather was simply perfect. 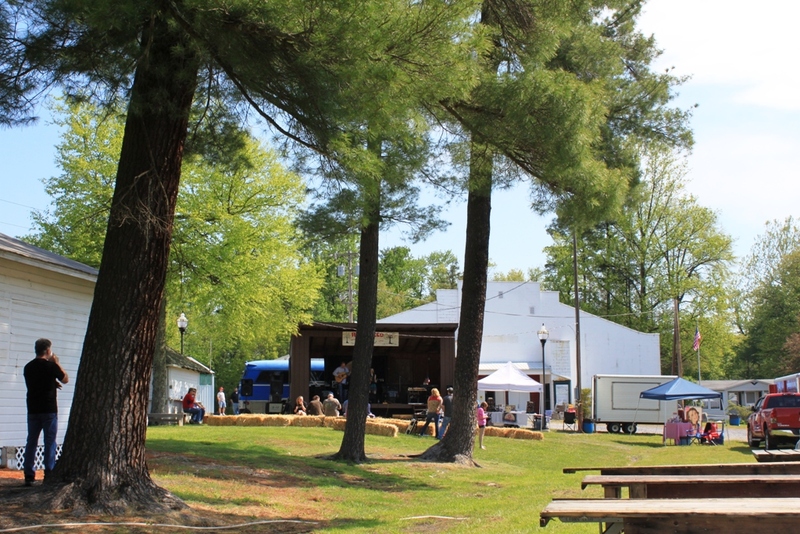 Part of the reason I enjoy this festival so much is simply because the grounds are so beautiful--no macadam anywhere. Even the parking lot is grass. The few buildings around have been here for years and fit in with the surroundings. 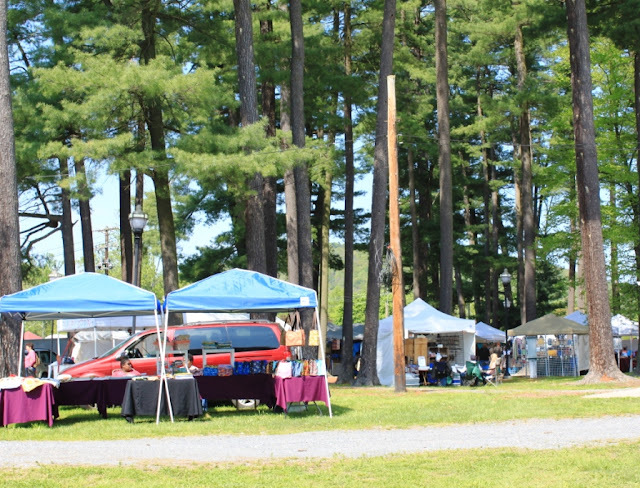 Many of the vendors bring their own tents and canopies. I can wander around the wares and food stands and listen to the pines whispering in the breeze as I do. To me, that's just about perfect, too. The apple blossom festival is my favorite of the two. It's smaller and much less crowded, which means getting around the festival and seeing what's here is easier, too. This year the blossom festival was a bit smaller and even less crowded than usual--probably because it fell this year on Mother's Day, which it doesn't always. The harvest festival is huge, with perhaps triple the number of vendors. Sometimes it's tough to navigate, even if I plan to attend during the hours when it's likely to be the least busy. For me, there's simply no better fairgrounds anywhere than this one. I hope your own area has one that's just as perfect. Yesterday evening I found myself driving on a road I travel fairly regularly but in the opposite direction of my usual route. This is how I came to find the pretty view in today’s photo. Normally, as I travel this dirt road through the gamelands, I am heading west, climbing up the mountain and trying to avoid the potholes. I look in front of me and to the sides, but that’s it. So last night I’m coming home, not long ahead of an evening thunderstorm, and this time I’m traveling down the mountain (but still trying to avoid the potholes). That’s when I passed an opening in the surrounding forest, and I got a quick glimpse of this view. I didn’t ever remember seeing it before, despite my familiarity with the road. Because of how the trees extend along the one side of this tractor entry, the view is pretty much obscured when someone is driving uphill and is only noticeable when driving downhill, when the small break in the trees isn’t so obscured. So I stopped the car in the middle of the downhill grade and cautiously backed uphill for a better view. The coming storm was already darkening the sky, casting an odd light across the fields and the neighboring mountain. How often have I passed this spot and never noticed the opening in the trees that leads to this pretty view? At this point I was only three miles or so from the cabin and in an area I thought I knew well. How many other interesting sights are right around my corner that I don’t see because I am used to traveling in a particular direction? Last night traveling in the “wrong” rewarded me with a pretty view and made a familiar area seem new again. Who knows what else is out there for me to find on long familiar paths? It’s past time I start taking my own advice more often! Here’s to taking the wrong direction! 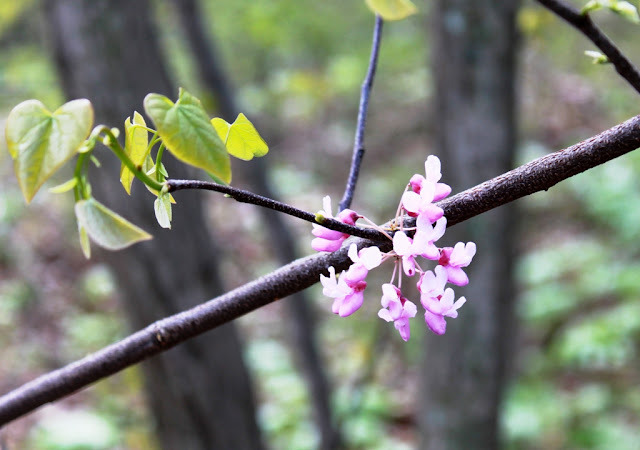 The redbud is beginning to fade, to settle down into green leaves instead of vibrant pink buds. The dogwood bloom is improving today. Yesterday I thought it nothing special, but today the blooms are more and further out. At this point, I will pronounce them no worse than average. A spectacular year in my opinion is one where the redbud and the dogwood peak at the exact same time. This year that won't happen. One problem around my mountain in trying to photograph redbud and/or dogwood is that both tend to be "edge" trees, and where there are forest edges there are also Other Things that I don't want in the photo that are unavoidable. Things like power lines, most often, but also a parking lot or an above ground water pipe or paintball netting or the like. Redbud also likes to hide in dense, scrubby areas, where getting a clear shot that doesn't include lots of other, less attractive greenery is a bit problematic. I should not complain at all, however. Even if I can't always get the photo I want, I am lucky enough to live among them both, where I can see and enjoy these beauties every day during their short span of annual glory. That's hard to beat. Clean-up after Thursday's tornado continues at Roundtop. Two large electrical transmission towers that cut through the forest were twisted like tin foil, and crews have worked on them 24/7 throughout the weekend. Giant crane trucks and long trucks carrying new metal pieces continue to clog the narrow road atop the mountain. The trucks are staging in the parking lots at Roundtop until they are needed. I can hear the trucks, occasionally, from the cabin. Sometimes the sound is different enough or loud enough to make the dogs bark, which is a lot worse than the sound of the trucks. Spring bird migration is gaining intensity right now. This weekend I spent a morning watching several black-throated blue warblers bounce around. I was out working on the chicken pen yesterday morning when the warblers joined me. It's kind of fun to be able to see them without binoculars and without developing "warbler neck" or "birder's neck" from looking nearly straight up for long periods of time trying to see thems. The birds were quiet close and didn't seem to mind me moving around doing chores. These lovely little blue warblers may be my favorite warbler, though chesnut-sided warblers are pretty high on my list, too. A pair of rose-breasted grosbeaks came to my father's feeders. Grosbeaks usually don't breed quite this far south, but it's also unusual, I think, for the birds to be paired off their nesting territory. The birds breed in New York state and even upstate Pennsylvania, so perhaps these will stay around. A robin is nesting in the crook of a low tree just behind the cabin. When she is in her nest, she sinks down into it and is almost invisible. The nest is close enough for photos, but I haven't seen much that is too exciting yet. For now, it's enough to know where the nest is so I can keep an eye on it. Today's photo is a redbud tree. A few of the tree's heart-shaped leaves are shown in the left. This year has been a decent, if not a spectacular, spring for this tree. 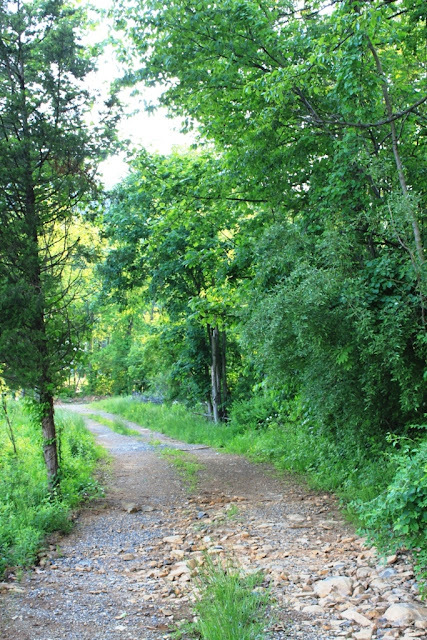 I have several behind the cabin and several that line the lane up to the cabin. One of the prettiest of the trees along the lane fell over sometime last fall, so the edge of the lane isn't quite as dense with them as before. This year the dogwood blooms aren't all that great. It's hard to know if that's because of the fungus that's damaging and killing the trees or if this is just that kind of year. 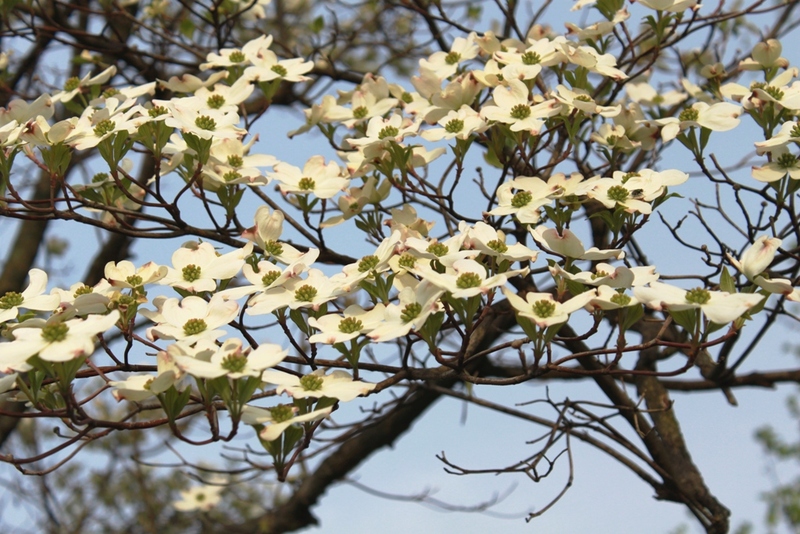 The extent of both dogwood and redbud color is variable from year to year. April was the wettest on record, and May isn't starting off much better, so finding a cause for this year's lack is complicated. The tornado news here on the mountain is winding down. I suspect it will take Roundtop at least a week to clear up the downed trees. I don' t know how long it will take to fix the transmission towers, but work seems to be progressing well there, too. I'm so grateful that the damage wasn't any worse than it was. No one was injured here and damage to buildings was minimal, considering how much worse it could have been.